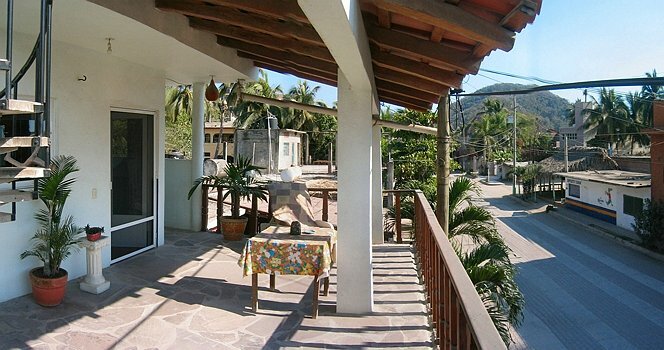 This second floor living space is just 160 steps from the beach (L-04 on the map). A terraza overlooking the main street in town, provides a birds eye view of the action of the pueblo. In addition being just two doors away from the “Casino Ejidal”, which hosts town events such as weddings, dances, quinceañeras and fiestas, entertainment is close at hand. The interior of our house is bright and open. Bright colors with large rooms and high ceilings create a friendly cheerful atmosphere. Can be rented as a 2 bedroom 2 bath unit, or 1 bedroom.